Spring finally arrived on the Outer Cape this weekend. Saturday brought bright sunshine and a strong warm southwesterly breeze to Wellfleet with temperatures inching into the 60s. The Turtle Journal team scooted over the tinkertoy Lieutenant Island Bridge at mid-tide falling to inspect salt marsh channels for terrapins burrowing out of winter brumation in the soft, oozy quickmud. It is a rare gift to observe a living head poke out of the “black mayonnaise,” soon followed by the leading edge of the carapace and finally the full turtle as it “swims” through the quickmud to the surface. If you’ve ever wondered why terrapins and terrapin researchers have such perfect youthful complexions, no need to ponder any longer. Look at Terrapin #834 above, a mature female we’ve been documenting for the last decade. Now gander at the post-cleanup shot below that illustrates her wrinkle-free skin! After six months buried under the mud, no question that #834 has a few stories to tell. Not too hard to figure out why they call it “Wrong Step Creek.” If you make one wrong step into the creek, it will be the last step you ever take. We find emerging turtles in this creek each springtime. The bottom is pure ooze and offers a warm, comfortable, easy blanket into which turtles submerge each winter to avoid freezing in the Great White North. 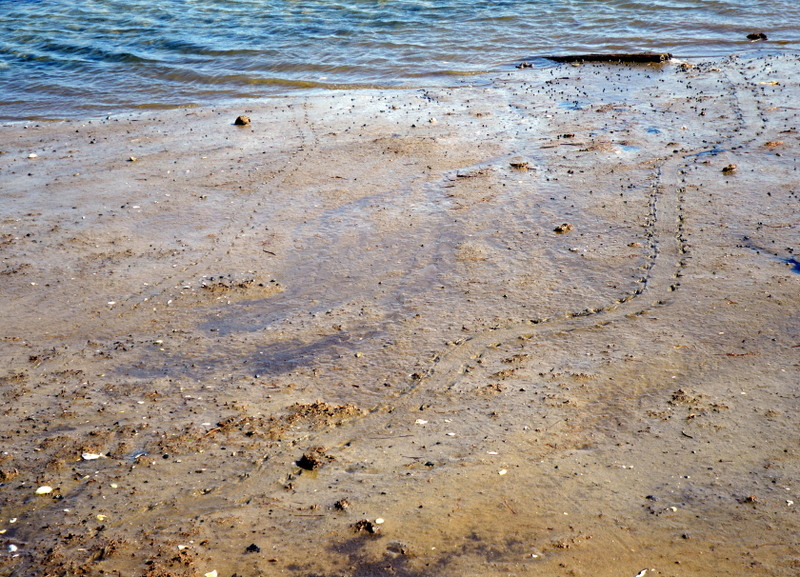 The black disturbed area in the photograph indicates the spot from which male terrapin #9250 emerged on Saturday. The Turtle Journal team brings you into the oozy creeks south of Lieutenant Island to witness a sight that very few humans have ever seen. The video clip begins with the recovery of male terrapin #9250 from a side channel off Wrong Step Creek, then the documentation of female terrapin #834 as she emerges from another side channel. This day marked the first time that we had observed #9250, but we have a long history of encounters with #834. She’s one of our beauties. Terrapin #834 weighed in at 1220 grams and measured 19.2 centimeters straight-line carapace length on Saturday. She was born in 1988 and spends her life in the estuaries and tidal flats around Lieutenant Island in South Wellfleet. We first encountered #834 as she emerged from brumation on May 4th, 2000. She was buried into the bank of North Creek, a stone’s throw from Wrong Step Creek, tail down and head up. If you look closely at the photograph above, you can detect the forward edge of her carapace framing her face. 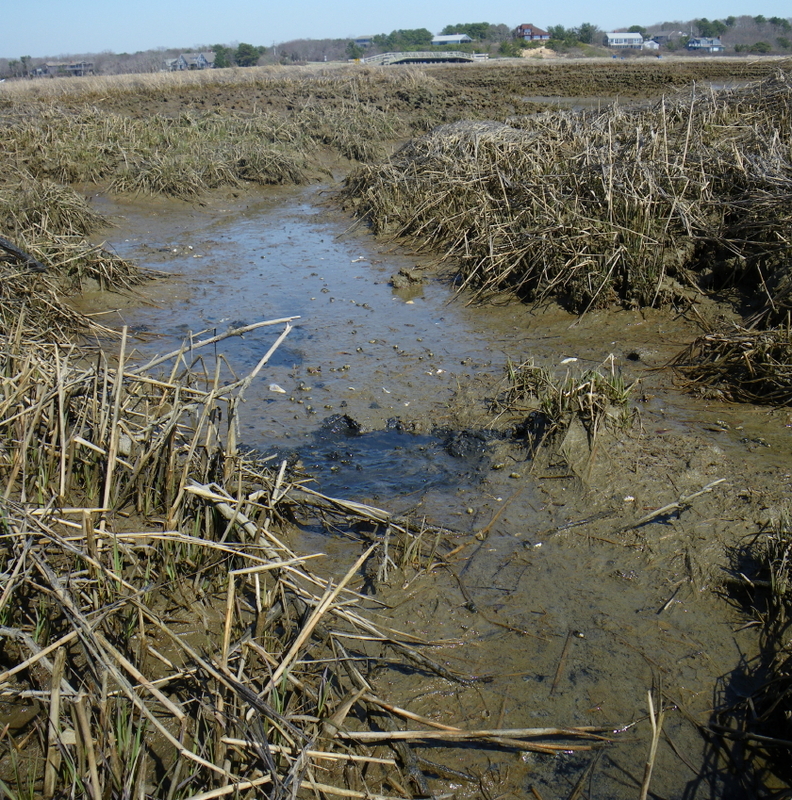 We can’t believe that we actually saw her as we stepped through the Spartina alternaflora. Back then she measured 18.5 centimeters and weighed 1126 grams. 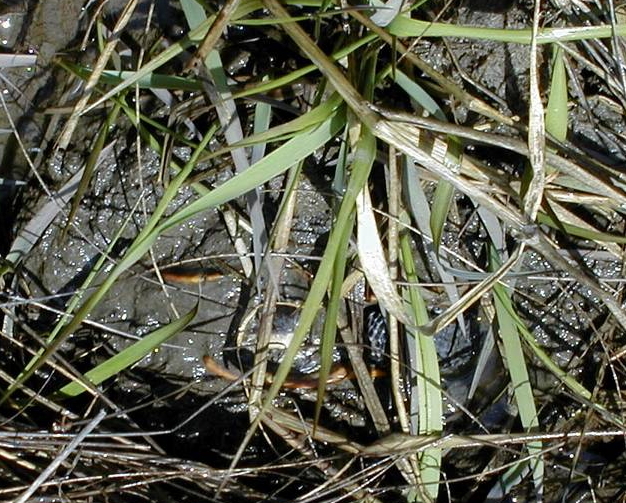 Our field school found her nesting on nearby Marsh Road in late June 2001 (the site of the photograph below) and we found her emerging from brumation in mid April 2002 in Wrong Step Creek. #834 was discovered twice more nesting on Marsh Road in 2003 and 2008, before Saturday’s last encounter. Once cleaned up, female #834 (left) and male #9250 (right) make an adorable couple. You can still see the mud caked inside the front limb cavity of #834. For the record, male #9250 weighed in at 284 grams and measured 12.15 centimeters straight-line carapace length. 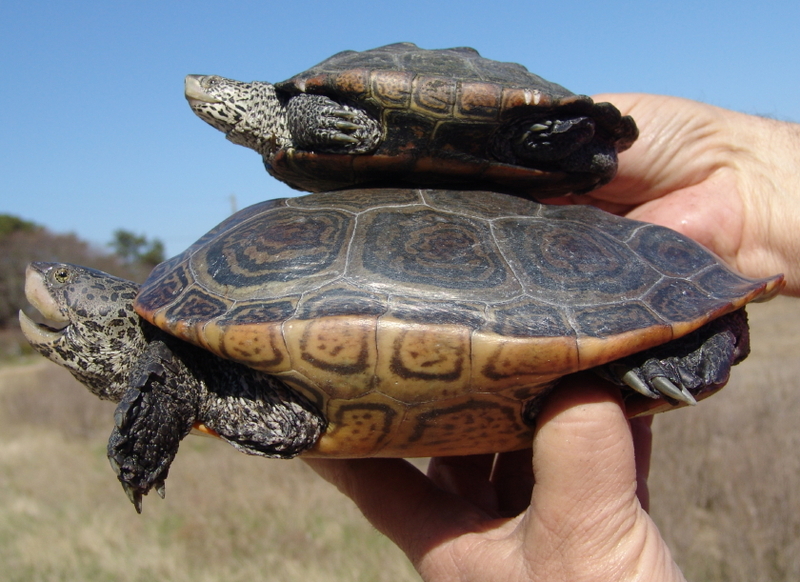 The adorable couple, #834 and #9250, offer a perfect illustration of gender (sexual) dimorphism in diamondback terrapins. Both are mature turtles at approximately 95% of maximum size for males and females within the Cape Cod Bay population of terrapins. So, the size comparison of female (bottom) to male (top) is quite accurate. The most fun part of research is always the release, returning animals to the wild. Sue Wieber Nourse let the adorable couple go at the edge of Black Duck Creek west of the Lieutenant Island Bridge at the mouth of Wrong Step Creek. The wonderful aftermath of turtle tracks etched into the ooze and leading to the bay topped a perfect beginning to the active season of diamondback terrapins in the Land of Ooze. It’s a tough life, but someone has to live it. 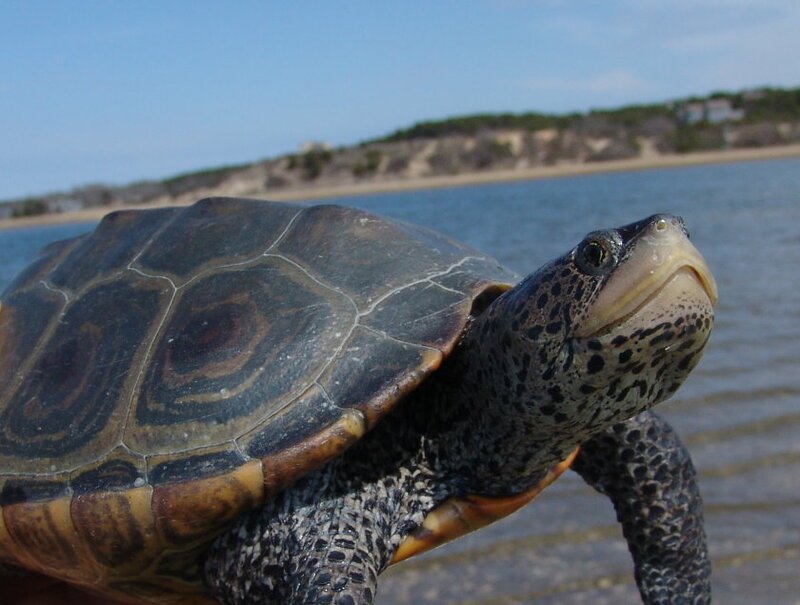 Each summer the Turtle Journal team and Mass Audubon’s Wellfleet Bay Wildlife Sanctuary offer people a unique opportunity to participate in hands-on, original field research on the Turtles of Cape Cod. For four exquisite days, participants discover the secrets of Cape Cod’s mysterious natural history as revealed by its diverse turtle species. 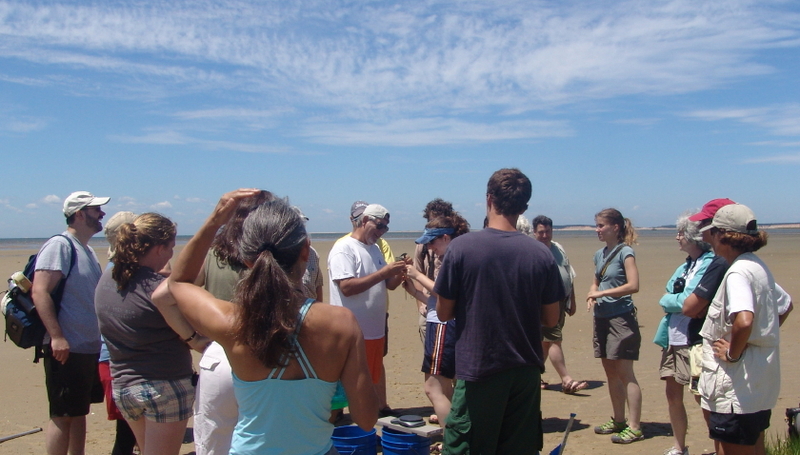 The photograph above illustrates the arduous conditions of a day on the low-tide drained tidal flats of South Wellfleet at the kickoff of the 2008 field school. 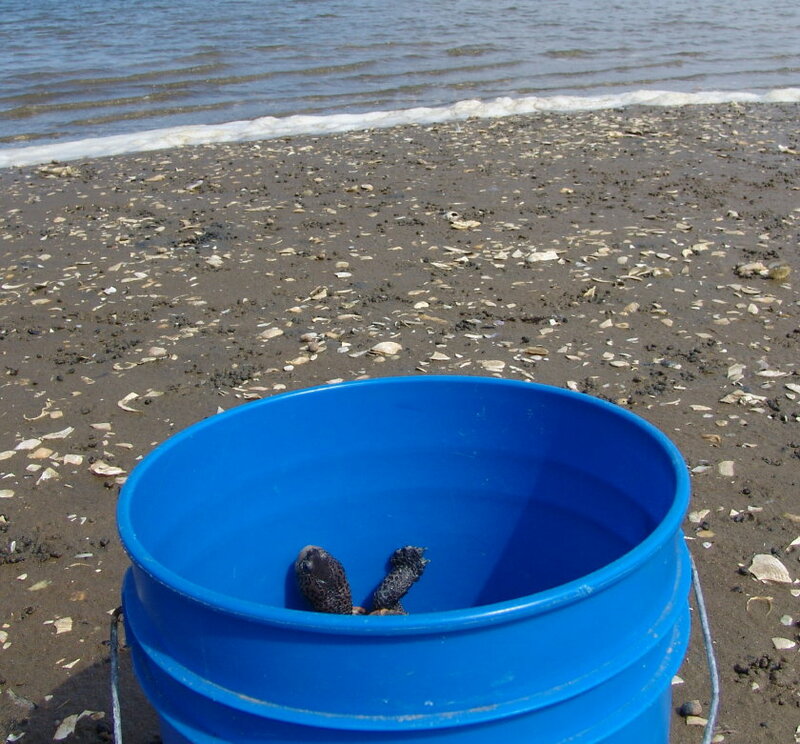 When frolicking in the surf in search of elusive terrapins proves a bit too arduous, our outdoor classroom migrates to abutting oak-pine woodlands of the pristine Wellfleet Bay Wildlife Sanctuary to learn about Eastern box turtles, as well as fresh water aquatic species. This young juvenile found for the first time by 2008 field schoolers was equipped with a small radio transmitter to tell us more about how box turtles use the habitat and to help us advance conservation of this species of special concern throughout Massachusetts. Don’t miss the fun. There are only a few openings available each year as we limit field school size so that everyone gets individual attention and enjoys the excitement of hands on discovery. 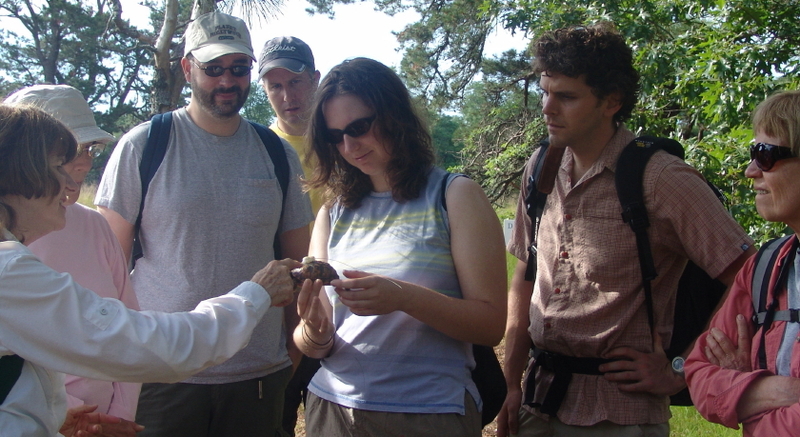 You can download an Adobe Acrobat (pdf) version of the field school catalogue and registration form by clicking here (fieldschool2009). 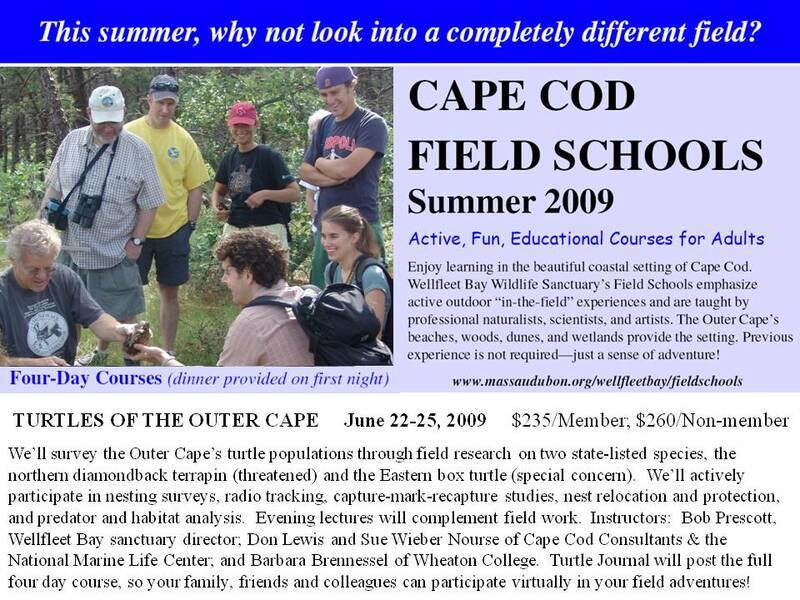 We hope to see you at this year’s Turtles of Cape Cod Field School. If you’d like to see more pictures and video clips from the 2008 adventure, you may visit our Turtles 2008 Facebook page. Sad as this statement is to say, the Turtle Journal team receives no remuneration, financial or otherwise, from the Turtles of Cape Cod Field School … other than the chance to meet some of our friends and colleagues in the most beautiful spot in the world, the Land of Ooze. BUT your participation does help to support Mass Audubon and its Wellfleet Bay Wildlife Sanctuary, and all the wonderful work that they do to save the nature of Massachusetts. Meet one of our locals, the spotted turtle (Clemmys gutata), better known and identified by the Turtle Journal team as #5 . Number 5 is an old friend and an inhabitant of Marion’s abandoned Goldwitz cranberry bog and surrounding woodlands, meadows and pools. An 11-year-old male, Number 5 drops into the defunct cranberry bog each spring in active pursuit of breeding females. 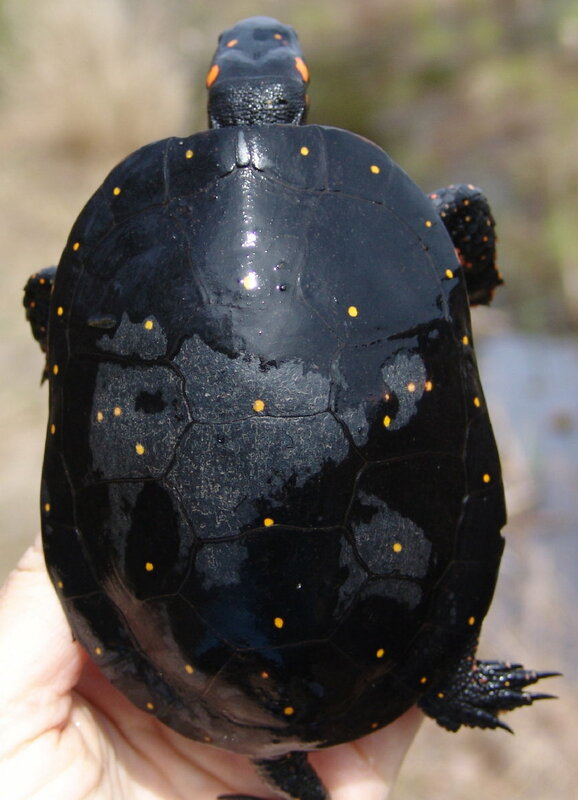 Spotted turtles mate during the spring months of March, April and May. We found #5 crawling along the bottom probably looking for companionship. In 2006, we found #5 swimming along the same area; in 2007, #5 he was basking in the sun on the bank above. Sporting beautiful yellow dots that allow him to blend in perfectly with bog vegetation, #5 has managed to grow from 135 grams in 2006 to 145 grams today. His slow growth pattern confirms the small size of this turtle species. Males and females are easily distinguished. Notice this young male’s large tail, his concave plastron, and dull brown eyes and chin. Spotteds express sexual dichromatism with females having brightly colored chins and orange eyes. 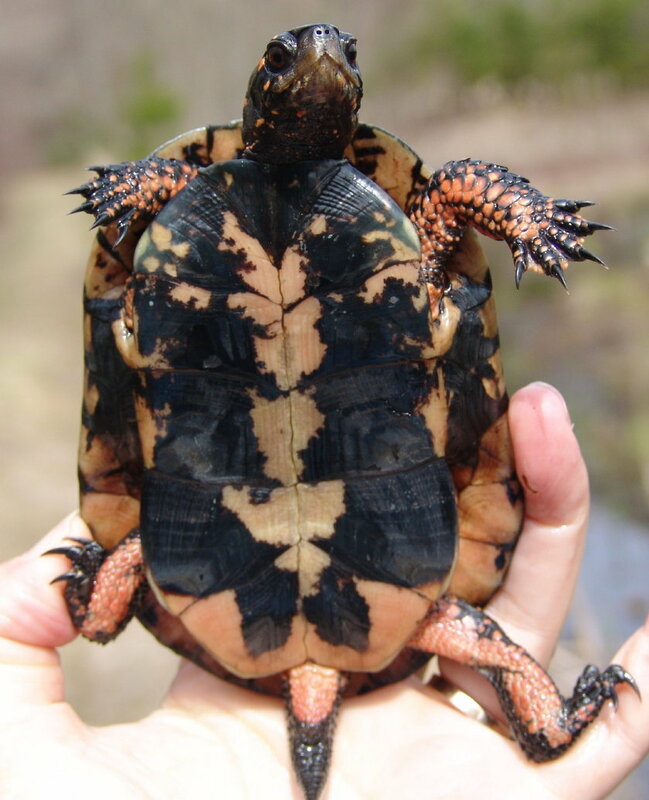 Females also sport a flat plastron and thin, smaller tail. Spotteds tend to be a smaller turtle, growing no larger than 5 inches. 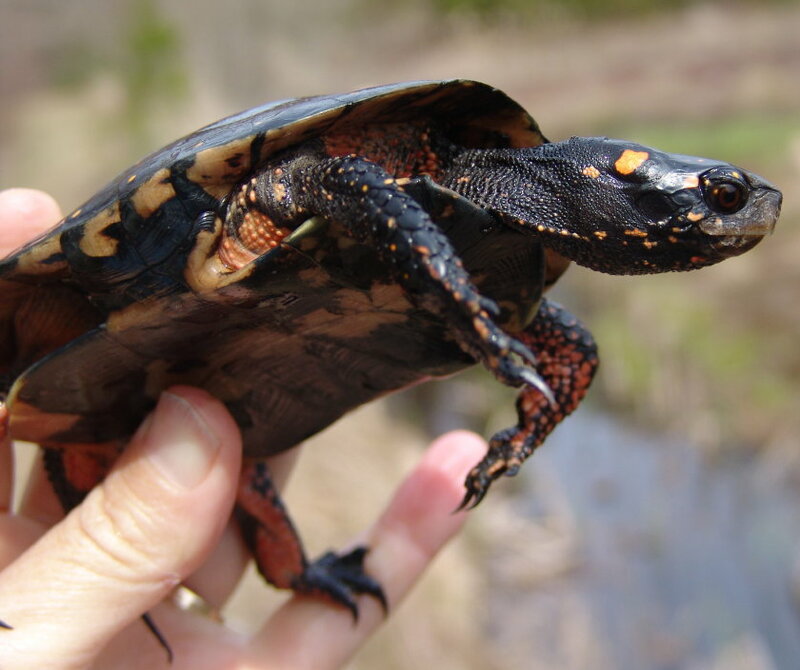 Over the protest of environmentalists, spotted turtles were delisted in the state of Massachusetts in 2006 although loss of wetlands habitat seems to be reducing their numbers. Hurray! 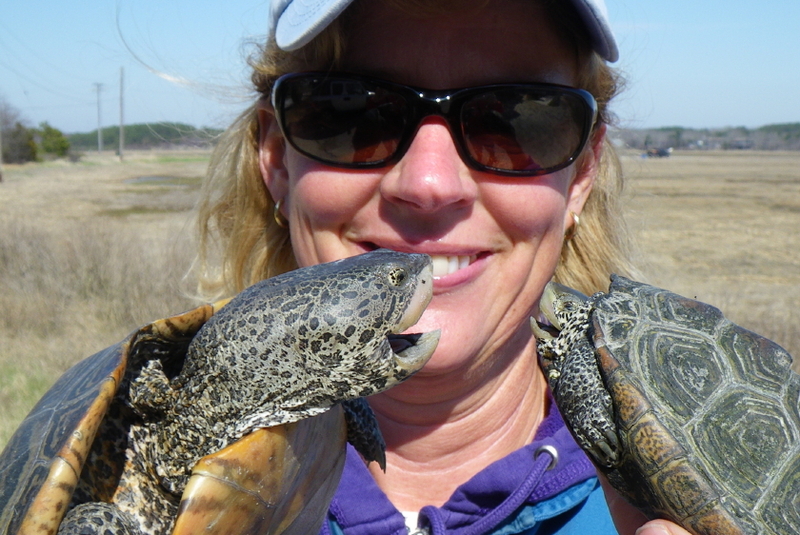 The Turtle Journal team released terrapin #2102, a cold-stunned female discovered in Chipman’s Cove in late February by shellfisherman Clint Austin. After two months of rehabilitation at Turtle Journal Central, she appeared eager to resume her place in the wild. So, on Saturday the 18th, we brought #2102 to the Outer Cape and reintroduced her to Chipman’s Cove, a decidedly more welcoming place than when we found her as a winter ice cube. See Frozen Diamondback Terrapin Rescued from Near Certain Death in Wellfleet Harbor. We measured #2102 at 18.45 centimeters straight-line carapace length and weighed her at 1035 grams before her release. As we completed her final examiniation, Terrapin #2102 inspected us with the same intensity with which we looked over her. We swear she winked at us to let us know she appreciated the long, hard rehabilitative process. How’s that for anthropomorphism! As we walked from the parking lot to Chipman’s Cove, she reacted with intense scratching at the sides of her bucket. Her terrapin home was within reach! We waited for a few minutes while shellfishermen finished their low tide harvest in the cove. As you can tell from the photograph above, #2102 proved just a bit impatient to get “on with it.” And so we did. The tide began to flood the cove’s tidal flats that had baked in the sun since mid-morning. 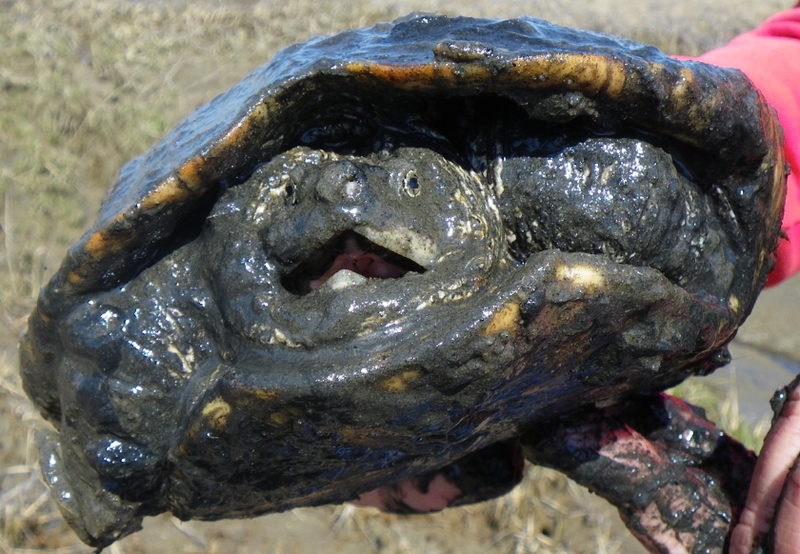 Terrapin #2102 began crawling slowly towards the waterline over beds of ribbed mussels, oyster shells and mud snails. Her pace grew steady, and typical of terrapins returning to the bay, she thrust her head into the wavelets and marched into the shimmering cove. A few feet from shore, she stretched her legs, kicked off and swiftly swam into the deeper channel. So long, #2102. With any luck, we should see her again in mid-May during the mating aggregation that occurs in Chipman’s Cove before nesting season begins in June. Fletcher, a juvenile loggerhead sea turtle (Caretta caretta), was found cold-stunned, upside-down and below the high water mark on Fisher Beach in Truro on Outer Cape Cod on the morning of 29 November 2008. 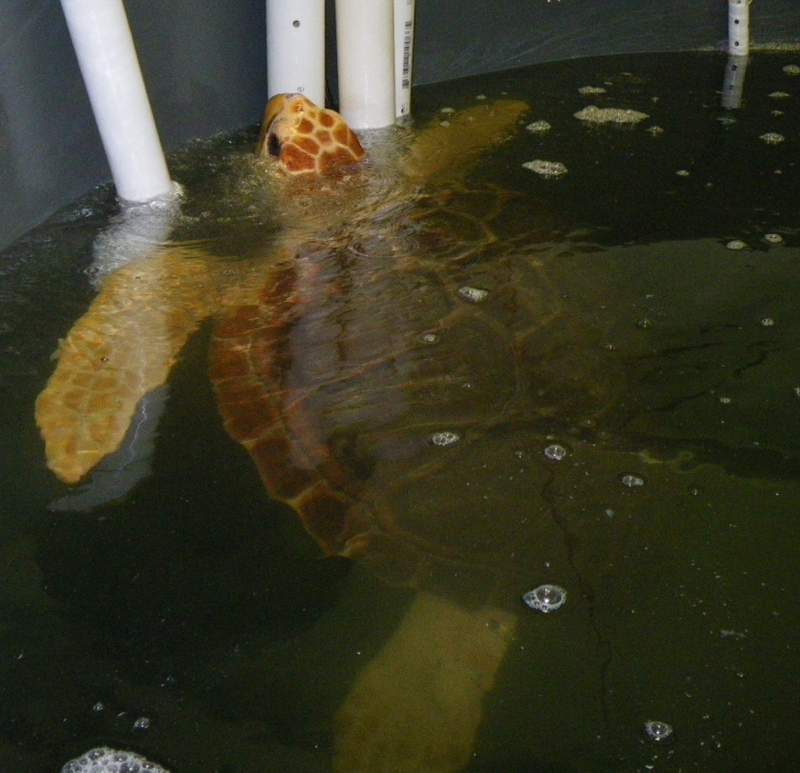 Discovered by one of the Mass Audubon volunteers who patrol the beaches each fall in search of stranded sea turtles, Fletcher was rushed to the Wellfleet Bay Wildlife Sanctuary, stabilized there and then transported to the New England Aquarium for medical treatment. 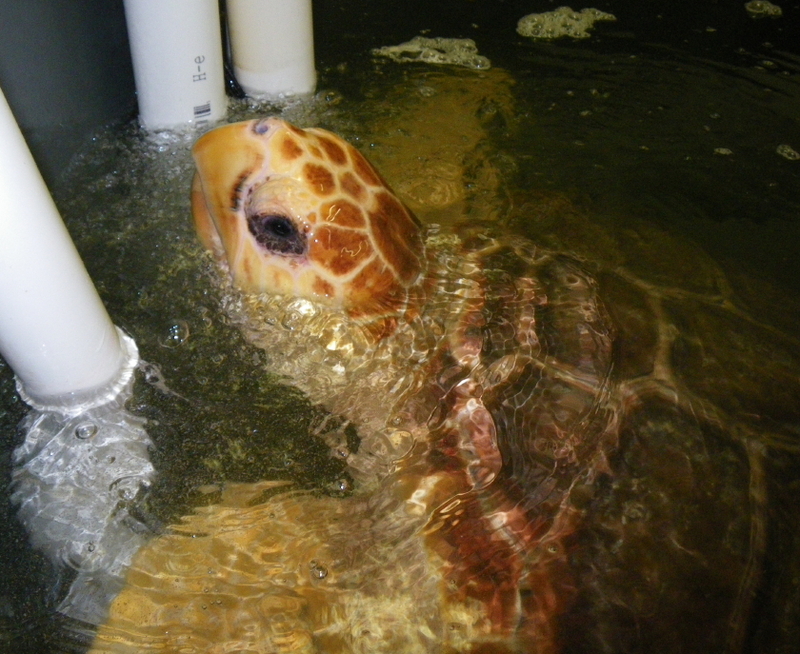 After initial medical care at the aquarium, Fletcher was transferred to the National Marine Life Center for rehabilitation during the long, cold winter. When found hypothermic on the beach in November, Fletcher weighed a little less than 52 pounds. Today, Fletcher approaches 70 pounds and energetically awaits release back into the wild. Within the next few days, Fletcher will be released off the Mid-Atlantic Coast into the Gulf Stream to resume a sea turtle’s life in the deep blue sea. Today, Fletcher will be equipped with a satellite tracking tag so that this sea turtle’s travels can be plotted and studied by researchers. We hope to monitor Fletcher’s satellite signal in the coming months and report Fletcher’s progress both here and on the National Marine Life Center’s site. 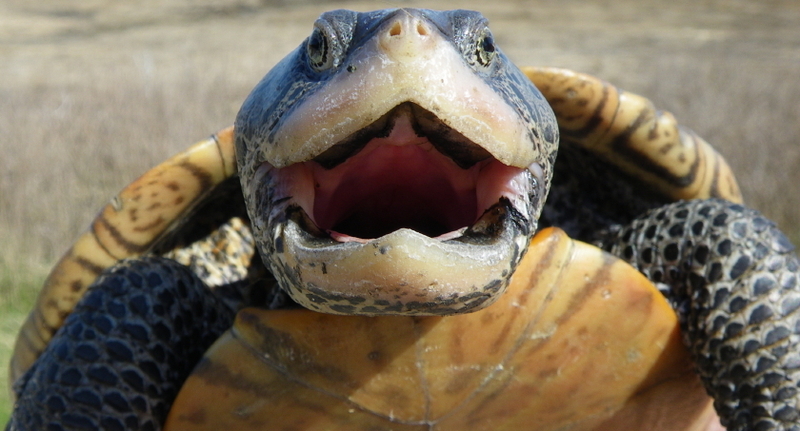 You are currently browsing the Turtle Journal blog archives for April, 2009.